When I spoke here three years ago Israel stood alone among the nations. Of the nearly 200 countries that sit in this hall, only Israel openly opposed the nuclear deal with Iran. We oppose it because it threatens our future, even our very survival. We opposed it because the deal paved Iran’s path to a nuclear arsenal. And by lifting the sanctions, it fueled Iran’s campaign of carnage and conquest throughout the Middle East. We oppose it because the deal was based on a fundamental lie that Iran is not seeking to develop nuclear weapons. Now, Israel exposed that lie earlier this year. Last February, Israel conducted a daring raid on Iran’s secret atomic archive. We obtained over 100,000 documents and videos that had been stashed in vaults in an innocent-looking building in the heart of Tehran. In May, I presented a short summary of what we obtained to the international media. I provided hard evidence of Iran’s plans to build nuclear weapons and its plans to deceive the international community. Israel shared this information and more damning evidence that we found with members of the P5+1 and with the international atomic energy agency. Months have passed, the IAA has still not taken any actions. It has not posed a single question to Iran. It has not demanded to inspect a single new site discovered in that secret archive. So given this inaction, I decided to reveal today something else that we have shared with the IAA and with a few intelligence agencies. What I’m about to say has not been shared publicly before. Today I’m disclosing for the first time that Iran has another secret facility in Tehran. A secret atomic warehouse for storing massive amounts of equipment and material for Iran’s secret nuclear weapons program. In May we exposed the site of Iran’s secret atomic archive. It’s right here in the Shuabad Distrcit of Tehran. Today I’m revealing the site of a second facility: Iran’s secret atomic warehouse. It’s right here, in the Turkuzahbad Distrcit of Tehran. Just three miles away. Let me show you exactly what the secret atomic warehouse looks like. Here it is. You see, like the atomic archive it’s another innocent-looking compound. Now for those of you at home using Google Earth, this no longer secret atomic warehouse. You have the coordinates, you can try to get there. And for those of you who try to get there: It’s 100 meters from the rug-cleaning operation. By the way, i hear they do a fantastic job of cleaning rugs there. But by now they may be radioactive rags. This is the second secret site. Now countries with satellite capabilities may notice some increased activity on the alley in the days and weeks ahead. The people they see scurrying back and forth are Iranian officials desperately trying to finish the job of cleaning up that site. Because you see– since we raided the atomic archive they’ve been busy cleaning up the atomic warehouse. Just last month they removed 15 kilograms of radioactive material. You know what they did with it? Those 15 kilograms of radioactive material, they had to get it out of this site so they took it out and they spread it around Tehran in an effort to hide the evidence. The endangered residents of Tehran may want to know that they can a geiger counter on Amazon for only $29.99. As of today, that’s just four million Iranian reals. But we’ll get to that later, I’ll talk about the Iranian economy in a minute. They took this radioactive material and spread it around Tehran. Now the Iranian officials cleaning out that site still have a lot of work to do because they’ve had at least 15 ship containers, they’re gigantic, 15 ship containers full of nuclear-related equipment and material stored there. Now since each of those containers can hold 20 tons of material this means that this site contained as much as 300 tons of nuclear-related equipment and material. Right here. So, distinguished delegates, you have to ask yourself a question. Why did Iran keep a secret atomic archive and a secret atomic warehouse? Because after all, when South Africa and Libya, when they gave up their nuclear programs the first thing they did was to destroy both the archives and the material and equipment. And the answer to the question is simple: The reason Iran didn’t destroy its atomic archive and its atomic warehouse is because it hasn’t abandoned its goal to develop nuclear weapons. In fact, it planned to use both of these sites in a few years when the time would be right to break out to the atom bomb. But ladies and gentlemen, rest assured, that won’t happen. It won’t happen because what Iran hides Israel will find. Ladies and gentlemen, I have a message to the head of the IAA, Mr. Yukiya Amano. I believe he’s a good man. I believe he wants to do the right thing. Well Mr. Amano, do the right thing. Go inspect this atomic warehouse. Immediately. Before the Iranians finish clearing it out. Distinguished delegates, do you remember when we were promised that inspections could take place anytime, anywhere? Remember that? Anytime, anywhere. Well, how about inspections right here, right now? And Mr. Amano– while you’re at it, inspect the other sites we told you about. Once and for all, tell the world the truth about Iran. Now I also have a message today for the tyrants of Tehran. Israel knows what you’re doing and Israel where you’re doing it. 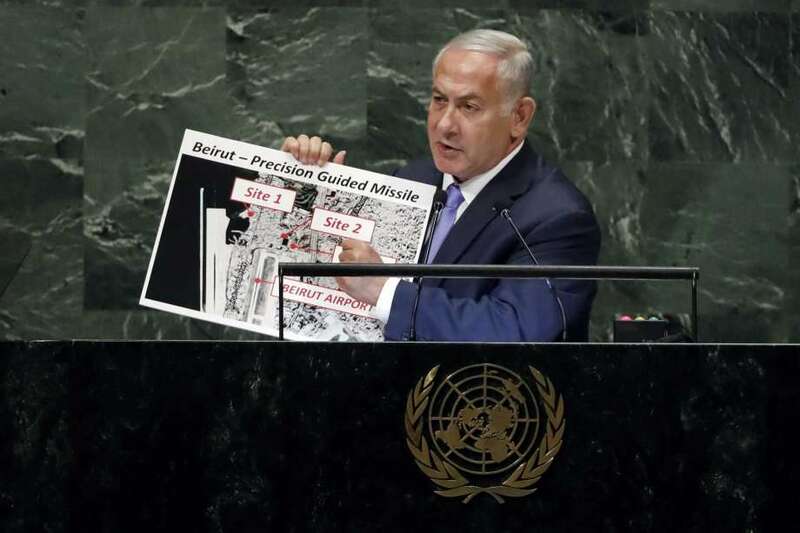 Israel will never let a regime that calls for our destruction to develop nuclear weapons. Not now, not in ten years, not ever. And Israel will do whatever it must do to defend itself against Iran’s aggression. We will continue to act against you in Syria. We will act against you in Lebanon. We will act against you in Iraq. We will act against you whenever, and wherever. We must act to defend our state and to defend our people. Distinguished delegates, three years ago, a few weeks after the nuclear deal was completed i asked this question from this very podium: Does anyone seriously believe that flooding Iran’s radical theocracy with weapons and cash will curb its appetite for aggression? But many of the deal’s supporters believed just that. They believed that Iran’s regime will become more moderate, more peaceful. They believed that Iran would use the billions of dollars it received in sanctions relief to improve the lives of its people. To solve the water problem. To solve the trucking problem. To solve the electricity problem. Hospitals, schools. That’s what they believed. Perhaps some of you also believed in that. Well, that didn’t happen. Instead, Iran used the money to fuel its vast war machine. Just this past year Iran has attacked Kurds in Iraq, slaughtered Sunnis in Syria, armed Hezbollah in Lebanon, financed Hamas in Gaza, fired missiles into Saudi Arabia and threatened freedom of navigation in the straits of Hurmuz and the Strait of Bab al-Mad. Some peace. Some moderation. Now if you think, if you think that Iran’s aggression has been confined to the Middle East think again. Last month two Iranian agents were arrested for plotting terror attacks right here, in the United States. And several weeks ago, Iranian agents were arrested for plotting terror attacks in the heart of Europe. Yet while the US is confronting Iran with new sanctions Europe and others are appeasing Iran by trying to help it bypass those new sanctions. Now I’ve just used a word. A tough word. A very strong word. Appeasement. And I use it reluctantly. But unfortunately that’s exactly what we’re seeing again. In Europe. Think about this. The same week Iran was caught red-handed trying to murder European citizens, European leaders were rolling out the red carpet for President Rohani, promising to give Iran even more money. I’m a historian’s son, I have to ask: I ask it not merely as a historian’s son, as a jew, as a citizen of the world, as someone who has lived through the 20th century- have these European leaders learned nothing from history? Will they ever wake up? Well we in Israel– we don’t need a wakeup call because Iran threatens us every day. Because despite the best of hopes and there were many hopes around the nuclear deal this deal did not push war further away. It brought war ever closer to our borders. In Syria, Iran has tried to establish permanent military bases against us and has already launched missiles and drones into our territory. In Gaza Iran is arming terror groups to launch rocket attacks into our cities and terror attacks against our civilians. In Lebanon, Iran is directing Hezbollah to build secret sites to convert inaccurate projectiles into precision-guided missiles. Missiles that can target deep inside Israel within an accuracy of ten meters. Hezbollah, listen to this, Hezbollah is deliberately using the innocent people of Beirut as human shields. They’ve placed three of these missile conversion sites along Beirut’s international airport. Here’s a picture that’s worth a thousand missiles. Here’s Beirut’s international airport. Here’s the first missile site. It’s in the Uzai neighborhood, on the water;s edge, a few blocks away from the runway. Here’s the second site. It’s underneath a soccer stadium, two blocks away. And here’s the third site. It’s adjacent to the airport itself, right next to it. So I have a message for Hezbollah today: Israel knows, Israel also knows what you’re doing. Israel knows where you’re doing it. And Israel will not let you get away with it. Ladies and gentlemen, the nuclear deal supporters were wrong about what would happen when sanctions would be removed. They were wrong, dead wrong about what would happen when sanctions would be restored. They argued that US sanctions alone will have little economic impact on Iran. That’s what they said. Really? Well let’s see what happened to Iran’s economy now that President Trump has forced companies to choose between doing business with Iran and doing business with the US, whose GDP is fifty times the size of Iran’s GDP. A year ago Iran’s economy was booming. Now it’s collapsing. Iran’s currency is plummeting. Inflation and unemployment are soaring. British airlines, German banks, French oil companies, Japanese oil importers and many others are scrambling to get out. If that’s little economic impact, imagine what will happen with the next batch of US sanctions imposed in November. I listened to these protests. I talked to the Iranian people. I share these videos. And I get so many responses. From Iranians. At first I thought these are Iranian exiles in the safety of London or Paris or Los Angeles. No. Iranians from Iran, embracing Israel, criticizing the regime— that’s an understatement— with their names. And I ask my intelligence people: What’s going on? And shortly after the protests broke out, not because of what I said but it was an indicator of something extraordinary that was taking place there because in these protests the Iranian people are showing unbelievable courage. From the urban centers to the outlying villages, and it’s embracing now the whole of Iran. From the striking Bazaar merchants to the young women uncovering their hair: the people of Iran are bravely standing up to a regime that has brutally repressed them for four decades and that has squandered their money, still squanders their money, in bloody wars across the Middle East. So here’s what I say to Europe’s leaders and to others: Instead of cuddling Iran’s dictators, join the U.S. and Israel and most of the Arab world in supporting new sanctions against a regime that endangers all of us in all of the world. Israel is deeply grateful to President Trump for his bold decision to withdraw from the disasterous nuclear deal with Iran. Many, many of our Arab neighbors are also grateful. And everyone who cares about the peace and security of the world should also be grateful. But ladies and gentlemen, I have an important confession to make: This may surprise you but I have to admit that the Iran deal has had one positive consequence, an unintended one but a positive consequence– by empowering Iran, it brought Israel and many Arab states closer together than ever before in an intimacy and friendship that I have not seen in my lifetime and would have been unimagineable a few years ago. And you know, when you form friendships around a threat, around a challenge, you quickly see opportunities. Not only for security but how to bring a better life for our people, which Israel can help and wants to help do. Israel deeply values these new friendships and I hope the day will soon arrive when Israel will be able to expand peace, a formal peace, beyond Egypt and Jordan to other Arab neighbors, including the Palestinians. I look forward to working with President Trump and his peace team to achieve that goal. I also want to use this opportunity, we’re here at the UN, a place I know because I served here as ambassador many years ago for many years, so I know something about the UN. So I want to use this opportunity to express Israel’s appreciation to President Trump and Ambassador Haley for the unwavering support they’ve provided Israel at the UN. They have unequivocally backed Israel’s right to defend itself. They rightly pulled out of a history-denying UNESCO and a morally bankrupt UN Human Rights Council. They have more resolutions about Israel than the rest of the world combined, I think. And tenfold compared to, I don’t know, Iran, Syria, you name it. Not even tenfold, because you can’t multiply zero by any number.